Keeping your electricity bill under control is usually easier said than done. Fortunately, innovative technologies have made managing your home’s energy usage simpler than ever. We take a look at a few recent developments that can help you slash your power bill with minimal effort. What are the top five energy-saving gadgets? Smart power boards function similarly to standard multi-boards, allowing users to make the most of limited power sockets. The difference is that smart power boards are able to measure the electricity flow from each outlet, allowing it to detect when devices are in use and when they are in standby mode. When the smart power board recognises a device on standby mode, it will cut the flow of electricity to that particular device without compromising energy flow to other connected electronics. The board can also recognise when you’re trying to turn a device back on and will recommence energy flow immediately. Smart power boards are extremely useful when it comes to home entertainment systems, as many of us will have powerboards completely loaded with electronics. The lounge room is often the biggest problem area for this, so the South Australian Government provided a list of the power use of many lounge room gadgets. Smart power boards are becoming increasing popular overseas, though Australians have been rather slow on its uptake, with smart power boards only really gaining traction in 2016. There have been some issues with certain models of smart power boards that have turned off consumers (excuse the pun); One particular model cuts off all power after only one hour. An alternative smart power board by Embertec – an Australian company – is however promising, with a three hour cutout, at a price of $99. It only features two sockets, but as the technology becomes more popular in Australia, price and size availability may well improve. Also known as privacy glass, it uses electro chromatic technology to tint the glass when an electric current is applied, letting you remotely tint and untint your windows when it suits. This is similar to transition lenses in your glasses, but controllable with your phone! It’s been known for some time that tinting windows helps cut cooling costs by keeping the heat out, but now you have the ability to let heat in on a cold day by removing the tint with a few swipes on a smartphone. Dynamic Glass, the credited developers of smart glass, claims this technology can save up to 23% on electricity costs. Ever wanted a centrally controlled monitoring system that allows you to see when and where electricity is being used in your home? It sounds like something out of an old sci-fi film, but in fact it’s already a reality. Most electricity and solar retailers now offer a range of systems which let you use your phone, tablet or computer to identify inefficient use of power (e.g. standby power), minimise peak demand, monitor the health of your solar systems, and provide insights into how to improve your home’s energy efficiency. Some systems go one step further. Homes with solar storage systems will soon be able to install energy management systems that will automatically control the source of your home’s energy. During peak periods, your home can draw electricity from stored solar energy, while during off-peak periods when electricity is cheapest, your home will draw from the grid. Real-time monitoring of energy use is a powerful tool to have in your hands. It can be automated or customised as much as you like. A monitoring system can go a long way in saving money on your power bills. Solar batteries are admittedly not a brand new technology, but recent innovations have advanced storage technology so much, we think it deserves a spot on this list. Solar storage technology allows users to store unused energy generated by the homes solar panels for use later on, rather than letting it go to waste. There are a number of storage systems available in Australia, though the range of products is only expected to grow. In peak conditions with an appropriately sized solar system, a 7kWh battery such as Tesla’s Powerwall, is expected to cover the majority of your household’s peak electricity use. Since Tesla exploded on to the scene, various other companies have realised the potential market share they are missing out on. Technology giants like Panasonic and Samsung have all jumped on board the solar battery bandwagon, as well as a couple of other smaller players. This ensures that the market stays competitive and will likely mean that prices for these solar batteries will decrease over time. Most of us know that incandescent bulbs are energy wasters and belong in the 20th century. Many people have switched over to LED or fluorescent lighting to save money, but what we might not have considered is automated lighting. Again, while this is not a new technology, many people are unaware of its benefits. With this technology you are able to control switches from anywhere with smartphone apps. This helps ensure that a light is never left on when you’re not in the room. While a light bulb doesn’t in itself use that much electricity, the savings from switching off certainly add up. What do I need to consider with energy-saving technology? The most important thing you need to consider with energy-saving technologies is the initial cost of purchasing the technology itself. While they can potentially help you save on your power bill, the upfront cost of these appliances can be prohibitive. This means that it will take some time to recoup the cost of buying the product. 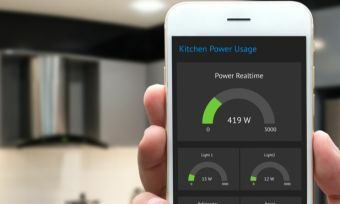 Appliances like smart power boards are relatively low cost, however even a $99 smart power board can take up to eight months to recoup the costs of. Other appliances which require integration can cost thousands and take years or decades to recoup the costs.